Reference image. 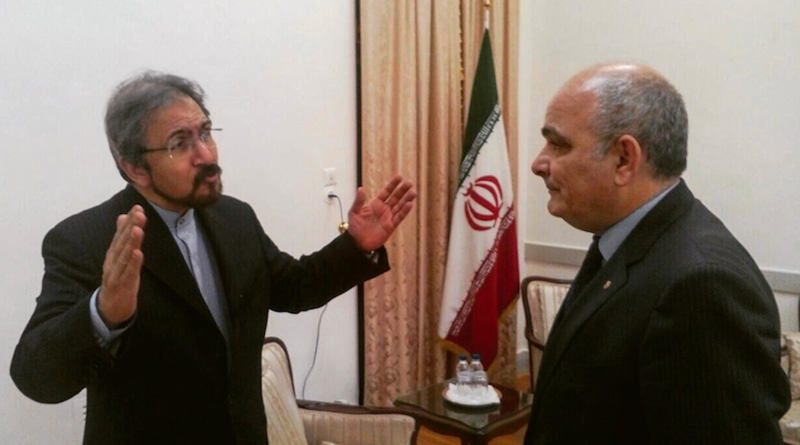 On the left is the spokesman of the Iranian MFA, Bahram Qasemi. On the right is Russia's Ambassador to Iran, Levan Dzhagaryan. Photo from the Russian Embassy in Iran's Twitter. Russia’s Ambassador to Iran, Levan Dzhagaryan, announced Sunday that his government offered some support so that the Middle Eastern country revamps the Fordow nuclear facility, located near the northern city of Qom. These recent Moscow-Tehran conversations are taking place within the framework of the Joint Comprehensive Plan of Action on Tehran’s nuclear program, which was signed in Vienna in the summer of 2015 and involves Iran, Russia, the United States, China, the United Kingdom, France and Germany. According to the deal, the Persian nation should produce no weapons-grade plutonium and reduce its stockpiles of enriched uranium in return for the removal of international sanctions. After Iran implemented its obligations, former US President Barack Obama lifted sanctions. However, following his announcement of a new strategy towards Iran, President Donald Trump refused to certify the agreement on January 13, 2018 and later on said that Washington would withdraw from it unless the accord’s “disastrous flaws" were fixed. The US President’s position is a cause of concern in both Tehran and Moscow, the Russian ambassador told TASS. "There are reasons to understand our European counterparts also worry about this, as they had applied much effort to reach the deal," he said. As part of the plan, Iran also agreed to convert the Fordow facility into a technology and science center and to give inspectors from the International Atomic Energy Agency access to the site. Early in 2017, IAEA verified the removal of excess centrifuges and infrastructure from the plant. According to NPO Nuclear Threat Initiative, 1,044 gas centrifuges remain installed in one wing of the facility, with IR-1 cascades installed separately for stable isotope production. Sunday also marked the 39th anniversary of the 1979 Islamic Revolution in Iran and amid pro and anti-government rallies, some protesters burned a white sheet reading "Barjam," the Farsi acronym for the JCPOA.